This idea is nothing particularly new, but when I first heard it I thought it was stretching the truth a bit – birds may have evolved from dinosaurs though surely they became something quite different. But now I’ve discovered a little more, it seems the two share so much in common they do need to be considered as one. In fact the idea began to take form back in the early days of evolutionary thinking. In 1868 Thomas Huxley first showed the similarities between Archaeopteryx and dinosaurs and proposed a link between the two. It was widely accepted at the time, but fell out of favour in the early twentieth century. One reason was the presence of the wishbone in birds. The wishbone is formed by the fusion of the collar bones and at that time no fossil from the dinosaurs that birds were supposed to have evolved from showed any collar bones. More recently collar bones showed up in the fossil record so the theory was back on the table again. Even more compelling evidence has come from the discovery of some dinosaur fossils that clearly had feathers. Feathers were originally thought to be the exclusive and defining feature of birds, so this discovery certainly put the cat amongst the pigeons so to speak. Or dare I say, the dinosaur amongst the pigeons. There is good evidence to suggest that some well known dinosaurs such as Tyrannosaurus and Velociraptor were feathered. All these features are also possessed by the group of dinosaurs they evolved from within. 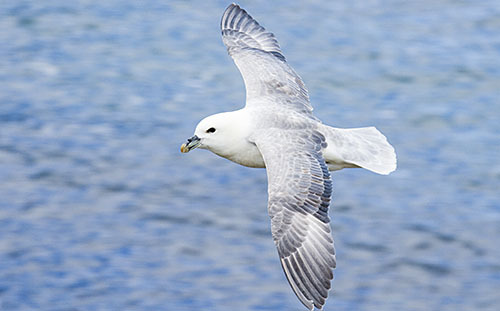 True, birds do have further exclusive adaptations, mainly associated with flying, but analysis of the large number of shared characteristics shows that they can be grouped with dinosaurs in modern classification. As I’ve mentioned in previous posts, all classification is arbitrary to some extent, but if we accept some method of grouping things then it does look like we have to merge these two together. It’s also very illuminating to consider Archaeopteryx, that wonderfully iconic early bird. It clearly had feathered wings that were capable of flapping flight, albeit probably rather weakly, so it was undoubtedly a bird, assuming this is the trait we now use to define birds. And yet it retained many of the more primitive dinosaur features. Unlike today’s birds it had teeth, a bony tail (a modern bird’s tail is purely feathers), clawed fingers on it’s forelimbs, many back vertebrae, an unfused pelvis and unfused foot bones. It may have had wings, but bodily it was very much a dinosaur. 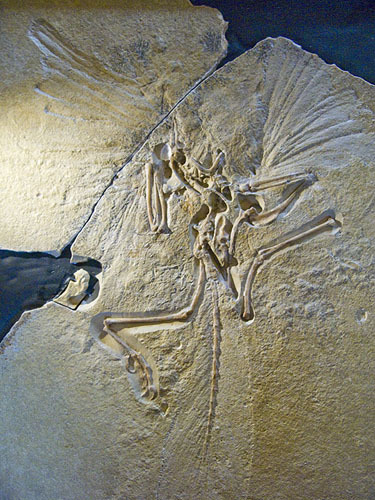 So if Archaeopteryx was a flying dinosaur, and Archaeopteryx was also a bird, then birds are dinosaurs. I guess it shouldn’t be such a difficult thing to accept. After all, we have no problem in calling bats flying mammals, so why not? And of course, it also means that dinosaurs never became extinct. Jurassic Park is in your garden right now.